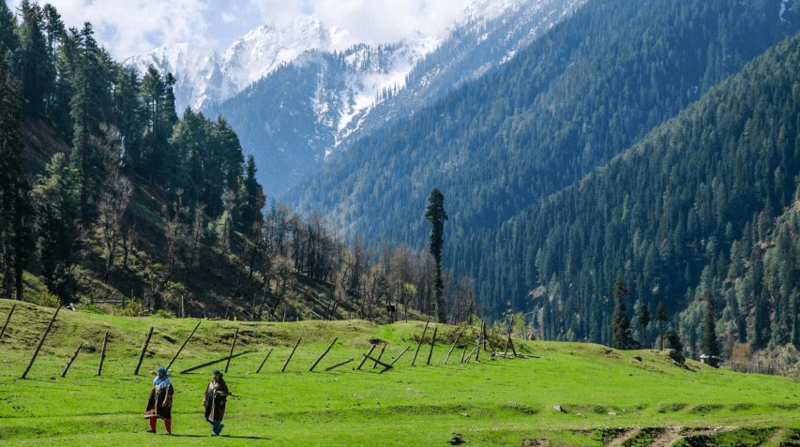 10 Beautiful Places To Visit In Kashmir In 2018: Kashmir, the heaven on Earth, is the best place to escape to rejuvenate yourself; there is no place as beautiful and vibrant as Kashmir is. Whether you are looking for honeymoon packages or just escaping to the beautiful hills with family and friends, Kashmir has so much to offer in terms of scenery and natural beauty which will surely be a treat to eyes. Beneath are the top 10 places in Kashmir that you must surely pay a visit to. Srinagar is the capital of Jammu & Kashmir and there is no doubt to the fact that Srinagar is most beautiful places to visit in Kashmir as well as in India from the time of Mughals. You can enjoy boating in the world famous Dal Lake, can trek with your friends, can watch chirping of birds in the peaceful environment etc. among various other activities which are very away from the hustle-bustle of the cities. If you want to experience something different in your life then book your stay in the iconic house boats on next visit; the beautifully designed Shikaras float on the Dal Lake which gives you a stunning view of the surrounded mountains. Start booking your air tickets in advance to avoid last minute inconveniences, use Air Asia coupons to book your tickets online at the best reduced prices. If you are nature lover, then Gulmarg should definitely be in your itinerary plan; Gulmarg is popularly known as the ‘Meadow of Flowers’. Watching the vibrant flowers spared throughout the valley with snowcapped mountains in background, is a treat to the eyes. Gulmarg is the snow paradise of Kashmir and has one of the world’s highest and largest ropeways with an aerial distance of approximately 5kms. The view from top of the mountains at a height of 3979 meters above sea level will mesmerize you and the tourists can also experience snow falls in summer as well. Sonmarg offers the breathtaking views to its visitors, has an endless stream of colorful flowers and undulated trekking routes are its major attractions. In addition to snow peaked mountains, you can enjoy river rafting, zorbing, trekking among other activities during your visit to this beautiful place. This place is accessible only in summers due to heavy snowfalls and avalanches in winters. Also, Sonmarg is the base point to start the religious Amarnath Yatra and was also a gateway connecting India and China during the historic Silk Route trade. Leh is one of the best places to visit in Kashmir in summers, as due to heavy snow majority of the tracks are closed in winters. The snow covered mountains, the alpine lakes, and the quaint setting makes Leh one of the best places to visit. If you are an adventurous person and have the passion of bike driving, then you must chase your skills here. Lot of bikers, college goers and adventure driver’s prefer vising Ladakh on bikes once in their lifetime to experience something different and challenging. The bone chilling water of Pangong Tso Lake, the vision of the Magnetic Hills and the beautiful blue sky will make you forgot everything and you will lose yourself in the natural beauty of Leh & Ladakh. Also if you are visiting Leh, don’t forget to spend some time on the Pangong Lake as it has become an important destination in Leh after the shooting of blockbuster film 3 Idiots was done on the lakeside. Click some amazing pictures of yours to share it with your family and friends. The blossoming meadows, alpine mountains, and the gushing clear water makes Kupwara a must visit pace in Kashmir. You can visit Lolab valley and Bungas valley as they hold a special significance among the citizens of Kopwara. This place is famous for the Kargil War of 1999, and is now a beautiful and peaceful tourist destination with historical importance. It is a getaway to enter Leh, thus majority of tourists visiting Leh spend their time there as a way to show respect to the brave soldiers who devoted their lives to save the country. Also the visitors from across the globe visit the ‘ranbhoomi’ of the war here and take some kind of souvenirs from the monasteries. During your next visit to Kargil, surely plan your one night stay in the military camps and listen to those amazing war stories from the army people which will surely give you a patriotic feeling. Pulwama is famous for its saffron fields which describes Kashmir in its best form. Pulwana which is about 40 kilometers away from Kashmir is known as ‘Anand of Kashmir’ or ‘Dudha-Kul of Kashmir’ due to its high milk production. This is a hidden gem in Kashmir which is very peaceful with tons of monasteries and national parks. If you are a wildlife enthusiast, then you must spend some quality time watching the nature at its best. The national park is home to various species such as Snow leopard and Bharals which are rarely found anywhere else. Hemis is located in Leh district, about 40 kilometers southeast of leh town. Try to make your visit in the month of July so that you can enjoy Hemis festival, a festival donned with multitude of colors and masks followed by monks wearing long horns and dancing to music. Kashmir Valley is the largest Himalayan valley which is an elliptical saucer shaped landmark of Kashmir. This 140 km long valley is the perfect spot for all trekkers and mountaineers and gives you many reasons to stop and click the pictures of the mesmerizing view which you will admire for your entire life. Surrounded by Lidder Lake and Betaab Valley, Pahalgam is the place you must visit to experience clear water rivers and exhilarating deep valleys. Lot of tourist visit this place to experience river rafting at Lidder Lake, golfing and shopping the traditional Kashmiri items from the local shops. The Lidder Valley, which is about 24 km away from Pahalgam, is a very popular camping site in Kashmir and the Lidder River which runs through Pahalgam is one of the best places for trout fishing in the country. Nest time makes sure you visit Kashmir if you want to see ‘Heaven on Earth’ with its alpine peaks and snow covered mountains; its beauty is just beyond our imaginations. From biking to trekking to living in house boats, you can enjoy the beauty of Kashmir with your family and friends. So hurry up and start booking your air tickets before the prices touch the sky, use Air Asia coupons to get the best discounts on the prices of tickets.